Below are the instructions from my dad on how to make a huge pan of baked ziti. I’ve made baked ziti for the past few years for St. Calzone’s Day and it has been pretty tasty. But like many dishes my father has taught me to make, it’s one of those that gets infinitely close to tasting like his, but never gets there. He’ll say the same thing about his father’s (my Nono’s) dishes too. 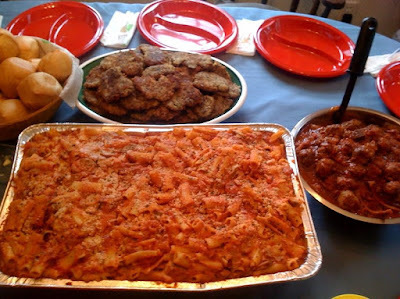 As a note, this picture has three of my all-time favorite things: Baked ziti, beef cutlets, and sausage and pork. Apparently my Nono made some spider potatoes too which nobody can beat. “I bought at Walmart what was called something like a huge disposable “Hefty brand professional catering pan”. It was $2.98. If you can’t find that, then from having checked the sizes and volumes of the pans that were available at Walmart, a large, deep turkey roasting pan is almost the same size (3/4 – 7/8 the size of the catering pan). I used 3.5 lbs of ziti, but I suggest you use 3 lbs. and it would be just right. I didn’t use Barilla and the Anna brand I used was fine, but Barilla just holds up better in the long run and suggest using Barilla. To mix in with the cooked pasta you will need the equivalent of 5 jars of sauce, then have another 1/2 jar reserved to spread on the top of all it before baking to make it look good (plus some grated cheese sprinkled on top), and then the remaining half jar plus a sixth jar to have heated and in a pan or bowl on the side for optional use when served. I used Francesco Rinaldi Original jar sauce (was .99 a jar at Price Rite), but their Marinara is great too. You just need to add more grated cheese (mixed in after it’s all in the big tray pan) if using the Marina because original has grated cheese in it already and Marinara doesn’t. FR brand is great because they don’t use high fructose corn syrup in it. More on the sauce in a bit. I also used 4 lbs. total of whole milk ricotta and almost 2 lbs. of shredded mozarella (used about 1 2/3 lbs. out of a 2 lb. bag). I didn’t put any mozzarella on top after it was all mixed in the pan because that always goes to waste by sticking to the foil after baking. In preparation, the day before I baked 4 lbs. of hot italian sausage and used 3 lbs. low fat ground beef to make and bake meatballs. I sliced up the sausages lengthwise and then across. I used a potato masher to crush up/break up all the meatballs after they cooled and after removing the grease from the pan.. I then ate 2 sausages and 2 meatballs for a late lunch on Saturday while they were still hot. Mmm…they were sooo good! Highly recommended. After the sausage and meatballs are all set, here’s my sequence of events including the very important special sauce process. This time I bought a package in the produce area of already peeled garlic cloves – there were approx. 30 but 20 or 40 would be just fine (a jar of already crushed or minced garlic would also be fine). While a fairly generous amount olive oil was heating in a VERY large pot, I used the mini processor to grind up all the garlic (not necessary if your using jar garlic) and then sauteed in the oil at a med temp making sure not to burn, just soften. Then I added all the cut up sausage and meatballs and sauteed it with the garlic till it was all heated through and sauteed a bit. Then I added the 5 jars of sauce, mixed and stirred a lot and let that heat on low on one of the smaller burners while I got another LARGE pot to cook the pasta ready with hot water from the faucet so that it would boil faster. I salted the water. Once the sauce and meat was all heated through together, I put a small amount in the bottom of the tray pan and when the pasta was ready and drained I dumped the pasta in the tray pan from the colander (took 3 times to drain it all because my colander isn’t very big). Then I added a bit of olive oil to the pasta and mixed. Then I added all the ricotta, mozzarella and a little grated cheese (grated cheese amount depending on if original or marinara sauce used or how your judgement depending on the sauce you make/use). After all the cheeses and pasta are roughly mixed together, I added all of the sauce/meat mixture and mixed all together well. Once mixed, I spread the 1/2 jar of sauce on the top, sprinkled some grated cheese on top, covered with foil and then baked in pre-heated oven at 325 for approx 1 hour 15 min. Took it out when I was ready to leave for Nono’s house so I’d say it’s OK for it to sit for at least an hour – 1 1/2 hours before serving and it was still very warm.